Truman Burbank is the unsuspecting star of The Truman Show, a reality television program which is broadcast live around the clock and across the globe. His entire life has taken place within a giant arcological dome near Hollywood, fashioned to create the seaside town of Seahaven Island, and equipped with thousands of cameras to monitor all aspects of his life. The producers discouraged Truman from wanting to leave Seahaven by instilling him with aquaphobia through the "death" of his TV father in a boating "accident," and by constantly broadcasting and printing messages of the dangers of traveling. All of Seahaven's other residents are actors, either acting out a script or repeating lines fed to them by the show's creator and executive producer, Christof. Christof seeks to capture Truman's real emotion and human behavior and give audiences a relatable everyman. Despite Christof's control, Truman manages to act in unexpected ways. During his college years, Truman was intended to fall in love with and marry co-student Meryl, but he fell in love with another actress, Sylvia. Sylvia managed to bring Truman out of the sight of cameras long enough to warn him that his reality is fake before she was taken away, with her "father" claiming they are traveling to Fiji. While Truman went on to marry Meryl, he continues to fantasize about Sylvia, using scraps from magazines to recreate her face in secret, and seeks travel to Fiji. Outside of the show, Sylvia has become part of a "Free Truman" campaign that demands the end of the show. The film begins during the thirtieth year of the show. Truman starts noticing unusual events that seem centered on him: a falling spotlight, a radio frequency that precisely describes his movements and rain that falls only on him. Truman spots a disheveled man and recognizes him as his father, who had snuck back onto the set, but other actors quickly drag the man away. Despite efforts by Meryl and Truman's best friend Marlon to reassure him, Truman becomes even more suspicious about his life. One day, he takes Meryl by surprise by going on an impromptu road trip, but their way is blocked by increasingly implausible emergencies. Meryl begins to break down from the stress; during an argument with Truman, she breaks character and is taken off the show. Hoping to bring Truman back to a controllable state, Christof re-introduces Truman's father to the show properly, under the guise of having lost his memory after the boating accident. This helps the show regain the ratings lead with audiences. Truman seems to return to his routines. One evening the production staff discovers that the sleeping Truman is completely out of their sight. Marlon is sent to check on Truman, finding that he has left a dummy and a tape recorder playing snoring sounds in his place and disappeared through a makeshift tunnel. Marlon breaks character, and Christof orders the first transmission cut in the show's history while a citywide search for Truman is launched. Audiences around the world are drawn to this sudden change. Truman is found sailing out of Seahaven, having conquered his fear of water, and Christof resumes the broadcast as he sends a man-made lightning storm to try to capsize the boat. Network executives fear that Truman may die on live television, but Truman manages to persist. Realizing he cannot dissuade Truman any further, Christof ends the storm. Truman continues to sail until, to his surprise, his boat strikes the wall of the dome. He finds an exit door, but Christof, speaking directly to Truman through a speaker system, tries to convince him to stay, stating there is "no more truth" in the real world and that by staying in his artificial world, he would have nothing to fear. Truman considers this, then states: "In case I don't see you... good afternoon, good evening, and good night," (previously his catch-phrase), takes a bow, and leaves. The viewers cheer Truman on, while Sylvia races to greet him. Christof's supervisors end the program for the last time and the viewers see what else is on TV. Jim Carrey as Truman Burbank: Chosen out of six unwanted pregnancies and the first child to be legally adopted by a corporation, Truman is unaware that his daily life is broadcast continuously around the world. He has a job in the insurance business and a wife, but he eventually notices that his environment is not what it seems to be. Robin Williams was considered for the role, but Weir cast Carrey after seeing him in Ace Ventura: Pet Detective because Carrey's performance reminded him of Charlie Chaplin. Carrey took the opportunity to proclaim himself as a dramatic actor, rather than being typecast in comedic roles. Carrey, who was then normally paid $20 million per film, agreed to do The Truman Show for $12 million. Carrey and Weir initially found working together on set difficult (Carrey's contract gave him the power to demand rewrites), but Weir was impressed with Carrey's improvisational skills, and the two became more interactive. The scene in which Truman declares "this planet Trumania of the Burbank galaxy" to the bathroom mirror was Carrey's idea. Laura Linney as Hannah Gill acting as Meryl Burbank, Truman's wife, a nurse at the local hospital. Since the show relies on product placement for revenue, Meryl regularly shows off various items she has recently "purchased", one of the many oddities that makes Truman question his life. Her role is to act the part of Truman's wife and ultimately to have a child by him, despite her reluctance to accomplish either. Linney heavily studied Sears catalogs from the 1950s to develop her character's poses. Ed Harris as Christof: The creator of The Truman Show. Christof remains dedicated to the program at all costs, often overseeing and directing its course in person (rather than through aides), but at the climax, he speaks to Truman over a loudspeaker, revealing the nature of Truman's situation. Dennis Hopper was originally cast in the role, but he left in April 1997 (during filming) over "creative differences". Harris was a last-minute replacement. A number of other actors had turned down the role after Hopper's departure. Harris considered making Christof a hunchback, but Weir did not like the idea. Noah Emmerich as Louis Coltrane playing Marlon, Truman's best friend since early childhood. Marlon is a vending machine operator for the company Goodies, who promises Truman he would never lie to him, despite the latest events in Truman's life. Emmerich has said, "My character is in a lot of pain. He feels really guilty about deceiving Truman. He's had a serious drug addiction for many years. Been in and out of rehab." Very little of this is shown in the finished film, but several deleted scenes depict Louis actively expressing guilt over Truman's situation, and in one sequence he spots Truman during his escape and purposely says nothing. His name is an amalgam of two jazz musicians, Louis Armstrong and John Coltrane, and in one scene he plays trumpet. Natascha McElhone as Sylvia playing Lauren Garland (Truman's college schoolmate): Sylvia was hired to play a background extra, a fellow student at Truman's college, named Lauren. She became romantically involved with Truman and tried to reveal to him the truth about his life, but was thrown out of the show before she could do so. She then becomes a protester against The Truman Show, urging Christof to release its lead. Brian Delate as Walter Moore playing Kirk Burbank, Truman's father. When Truman was a boy, his character on the show was killed off to instill a fear of water in his son that would prevent Truman from leaving the set; however, he sneaks back onto the set when Truman is an adult. This causes Truman to begin questioning his staged life, and as he tries to get away from it the writers are forced to write a plot in which Kirk had not drowned but had suffered from amnesia. Paul Giamatti as Simeon (control room director). Though second-in-command at the lunar room, he is conflicted when ordered to attempt to kill Truman via storm. Andrew Niccol completed a one-page film treatment titled The Malcolm Show in May 1991. The original draft was more in tone of a science fiction thriller, with the story set in New York City. Niccol stated, "I think everyone questions the authenticity of their lives at certain points. It's like when kids ask if they're adopted." In the fall of 1993, producer Scott Rudin purchased the script for slightly over $1 million. Paramount Pictures instantly agreed to distribute. Part of the deal called for Niccol to have his directing debut, though Paramount felt the estimated $80 million budget would be too high for him. In addition, Paramount wanted to go with an A-list director, paying Niccol extra money "to step aside". Brian De Palma was under negotiations to direct before he left United Talent Agency in March 1994. Directors who were considered after De Palma's departure included Tim Burton, Terry Gilliam, Barry Sonnenfeld and Steven Spielberg before Peter Weir signed on in early 1995, following a recommendation of Niccol. Bryan Singer wanted to direct but Paramount decided to go with the more experienced Weir. Weir wanted the film to be funnier, feeling that Niccol's script was too dark, and declaring "where he [Niccol] had it depressing, I could make it light. It could convince audiences they could watch a show in this scope 24/7." Niccol wrote sixteen drafts of the script before Weir considered the script ready for filming. Later on in 1995, Jim Carrey signed to star, but because of commitments with The Cable Guy and Liar Liar, he would not be ready to start filming for at least another year. Weir felt Carrey was perfect for the role and opted to wait for another year rather than recast the role. Niccol rewrote the script twelve times, while Weir created a fictionalized book about the show's history. He envisioned backstories for the characters and encouraged actors to do the same. Weir scouted locations in Eastern Florida but was dissatisfied with the landscapes. Sound stages at Universal Studios were reserved for the story's setting of Seahaven before Weir's wife introduced him to Seaside, Florida, a "master-planned community" located in the Florida Panhandle. Pre-production offices were immediately opened in Seaside, where the majority of filming took place. Other scenes were shot at Paramount Studios in Los Angeles, California. Norman Rockwell paintings and 1960s postcards were used as inspiration for the film's design. Weir, Peter Biziou and Dennis Gassner researched surveillance techniques for certain shots. The overall look was influenced by television images, particularly commercials: Many shots have characters leaning into the lens with their eyeballs wide open, and the interior scenes are heavily lit, because Weir wanted to remind viewers that "in this world, everything was for sale". Those involved in visual effects work found the film somewhat difficult to make, because 1997 was the year many visual effects companies were trying to convert to computer-generated imagery. CGI was used to create the upper halves of some of the larger buildings in the film's downtown set. Craig Barron, one of the effects supervisors, said that these digital models did not have to look as detailed and weathered as they normally would in a film because of the artificial look of the entire town, although they did imitate slight blemishes found in the physical buildings. Benson Y. Parkinson of the Association for Mormon Letters noted that Christof represented Jesus as an "off-Christ" ("Christ-off") or Antichrist, comparing the megalomaniacal Hollywood producer to Lucifer. The conversation between Truman and Marlon at the bridge can be compared to one between Moses and God in the Book of Moses. In C.S. Lewis and Narnia for Dummies by Rich Wagner, Christof is compared with Screwtape, the eponymous character of The Screwtape Letters by C. S. Lewis. "This was a dangerous film to make because it couldn't happen. How ironic." 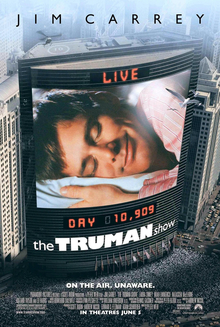 In 2008, Popular Mechanics named The Truman Show as one of the 10 most prophetic science fiction films. Journalist Erik Sofge argued that the story reflects the falseness of reality television. "Truman simply lives, and the show's popularity is its straightforward voyeurism. And, like Big Brother, Survivor, and every other reality show on the air, none of his environment is actually real." He deemed it an eerie coincidence that Big Brother made its debut a year after the film's release, and he also compared the film to the 2003 program The Joe Schmo Show: "Unlike Truman, Matt Gould could see the cameras, but all of the other contestants were paid actors, playing the part of various reality-show stereotypes. While Matt eventually got all of the prizes in the rigged contest, the show's central running joke was in the same existential ballpark as The Truman Show." Weir declared, "There has always been this question: Is the audience getting dumber? Or are we filmmakers patronizing them? Is this what they want? Or is this what we're giving them? But the public went to my film in large numbers. And that has to be encouraging." Ronald Bishop's paper in the Journal of Communication Enquiry suggests The Truman Show showcased the power of the media. Truman's life inspires audiences around the world, meaning their lives are controlled by his. Bishop commented, "In the end, the power of the media is affirmed rather than challenged. In the spirit of Antonio Gramsci's concept of hegemony, these films and television programs co-opt our enchantment (and disenchantment) with the media and sell it back to us." Simone Knox, in her essay "Reading The Truman Show inside out" argues that the film itself tries to blur the objective perspective and the show-within-the-film. Knox also draws a floor plan of the camera angles of the first scene. [A] prototypical adolescent at the beginning of the movie. He feels trapped into a familial and social world to which he tries to conform while being unable to entirely identify with it, believing that he has no other choice (other than through the fantasy of fleeing to a far-way island). Eventually, Truman gains sufficient awareness of his condition to "leave home"—developing a more mature and authentic identity as a man, leaving his child-self behind and becoming a True-man. Parallels can be drawn from Thomas More's 1516 book Utopia, in which More describes an island with only one entrance and only one exit. Only those who belonged to this island knew how to navigate their way through the treacherous openings safely and unharmed. This situation is similar to The Truman Show because there are limited entryways into the world that Truman knows. Truman does not belong to this utopia into which he has been implanted, and childhood trauma rendered him frightened of the prospect of ever leaving this small community. Utopian models of the past tended to be full of like-minded individuals who shared much in common, comparable to More's Utopia and real-life groups such as the Shakers and the Oneida Community. It is clear that the people in Truman's world are like-minded in their common effort to keep him oblivious to reality. The suburban "picket fence" appearance of the show's set is reminiscent of the "American Dream" of the 1950s. The "American Dream" concept in Truman's world serves as an attempt to keep him happy and ignorant. Originally set for August 8, 1997, the film's theatrical release was pushed back initially to November 14, 1997, but eventually was released in the summer of 1998. NBC purchased broadcast rights in December 1997, roughly eight months before the film's release. In March 2000, Turner Broadcasting System purchased the rights and now often airs the film on TBS. On Rotten Tomatoes, the film has a "Certified Fresh" rating of 94%, based on 125 reviews, with an average rating of 8.4/10. The site's critical consensus states, "A funny, tender, and thought-provoking film, The Truman Show is all the more noteworthy for its remarkably prescient vision of runaway celebrity culture and a nation with an insatiable thirst for the private details of ordinary lives." On Metacritic, the film has a score of 90 out of 100, based on 30 reviews, indicating "universal acclaim". Giving the film a perfect four star score, Roger Ebert compared it to Forrest Gump, claiming that the film had a right balance of comedy and drama. He was also impressed with Jim Carrey's dramatic performance. Kenneth Turan of the Los Angeles Times wrote, "The Truman Show is emotionally involving without losing the ability to raise sharp satiric questions as well as get numerous laughs. The rare film that is disturbing despite working beautifully within standard industry norms." He would name it the best movie of 1998. In June 2010, Entertainment Weekly named Truman one of the 100 Greatest Characters of the Last 20 Years. James Berardinelli liked the film's approach of "not being the casual summer blockbuster with special effects", and he likened Carrey's "[charismatic], understated and effective" performance to those of Tom Hanks and James Stewart. Jonathan Rosenbaum of the Chicago Reader wrote, "Undeniably provocative and reasonably entertaining, The Truman Show is one of those high-concept movies whose concept is both clever and dumb." Tom Meek of Film Threat said the film was not funny enough but still found "something rewarding in its quirky demeanor". At the 71st Academy Awards, The Truman Show was nominated for three awards but did not win in any category. Peter Weir received the nomination for Best Director, while Ed Harris was nominated for Best Supporting Actor and Andrew Niccol was nominated for Best Original Screenplay. Many believed Carrey would be nominated for Best Actor, as well as the film itself for Best Picture, but neither was. In addition, The Truman Show earned nominations at the Golden Globe Awards for Best Motion Picture – Drama, Weir for Best Director – Motion Picture and Niccol for (Screenplay). Jim Carrey and Ed Harris both won Golden Globes as Best Actor – Drama and Best Supporting Actor, respectively, as did Burkhard Dallwitz and Philip Glass for Best Original Score. At the 52nd British Academy Film Awards, Weir (Direction), Niccol (Original Screenplay) and Dennis Gassner (Production Design) received awards. In addition, the film was nominated for Best Film and Best Visual Effects. Harris was nominated for Best Supporting Actor, and Peter Biziou was nominated for Best Cinematography. The Truman Show was a success at The Saturn Awards, where it won the Best Fantasy Film and the Best Writing (Niccol). Carrey (Best Actor), Harris (Best Supporting Actor) and Weir (Direction) also received nominations. Finally, the film won speculative fiction's Hugo Award for Best Dramatic Presentation. Joel Gold, a psychiatrist at the Bellevue Hospital Center, revealed that by 2008, he had met five patients with schizophrenia (and heard of another twelve) who believed their lives were reality television shows. Gold named the syndrome "The Truman Show delusion" after the film and attributed the delusion to a world that had become hungry for publicity. Gold stated that some patients were rendered happy by their disease, while "others were tormented". One traveled to New York to check whether the World Trade Center had actually fallen—believing the 9/11 attacks to be an elaborate plot twist in his personal storyline. Another came to climb the Statue of Liberty, believing that he would be reunited with his high school girlfriend at the top and finally be released from the show. In August 2008, the British Journal of Psychiatry reported similar cases in the United Kingdom. The delusion has informally been referred to as "Truman syndrome", according to an Associated Press story from 2008. After hearing about the condition, Andrew Niccol, writer of The Truman Show, said, "You know you've made it when you have a disease named after you." ^ "The Truman Show". British Board of Film Classification. Retrieved December 27, 2015. ^ "The Truman Show (1998) - Financial Information". The Numbers. Retrieved December 27, 2015. ^ "The Truman Show (1998)". Box Office Mojo. Retrieved December 27, 2015. ^ a b Sofge, Erik (March 28, 2008). "The 10 Most Prophetic Sci-Fi Movies Ever". Popular Mechanics. Archived from the original on March 31, 2008. Retrieved March 31, 2008. ^ Steinberg, Don (September 23, 2011). "Films Inspired by Rod Serling's "The Twilight Zone" – Snapshot". The Wall Street Journal. Retrieved July 14, 2012. ^ a b c d e f g h Svetkey, Benjamin (June 5, 1998). "The Truman Pro". Entertainment Weekly. Retrieved March 16, 2008. ^ Weinraub, Bernard (May 21, 1998). "Director Tries a Fantasy As He Questions Reality". The New York Times. Retrieved April 1, 2008. ^ a b Busch, Anita M. (April 7, 1997). "New Truman villain: Harris". Variety. Retrieved March 27, 2017. ^ a b c d How's It Going to End? The Making of The Truman Show, Part 2 (DVD)|format= requires |url= (help). Paramount Pictures. 2005. ^ a b c d e How's It Going to End? The Making of The Truman Show, Part 1 (DVD)|format= requires |url= (help). Paramount Pictures. 2005. ^ Benedict Carver (June 22, 1998). "'Truman' suit retort". Variety. Retrieved May 15, 2009. ^ a b c Johnston, Sheila (September 20, 1998). "Interview: The clevering-up of America". The Independent. London. Retrieved April 1, 2008. ^ a b Fleming, Michael (March 10, 1994). "SNL's Farley crashes filmdom". 'Variety. Retrieved March 8, 2008. ^ Fleming, Michael (February 18, 1994). "TriStar acquires female bounty hunter project". 'Variety. Retrieved March 8, 2008. ^ Blackwelder, Rob (August 12, 2002). "S1M0NE'S SIRE". Spliced Wire. Retrieved March 28, 2008. ^ Bernard Weinraub (July 9, 2000). "An Unusual Choice for the Role of Studio Superhero". The New York Times. ^ a b c Rudolph, Eric (June 1998). "This is Your Life". American Cinematographer. Retrieved April 1, 2008. ^ a b Faux Finishing, the Visual Effects of The Truman Show (DVD)|format= requires |url= (help). Paramount Pictures. 2005. ^ Rickitt, Richard (2000). Special Effects: The History and Technique. Billboard Books. pp. 207–208. ISBN 0-8230-7733-0. ^ Benson Y. Parkinson. "The Truman Show (film)". Archived from the original on July 27, 2011. Retrieved January 10, 2010. ^ Parkinson, Benson (September 19, 2003). "The Literary Combine: Intimations of Immortality on The Truman Show". Association for Mormon Letters. Archived from the original on February 9, 2008. Retrieved March 25, 2008. ^ Wagner, Richard (2005). "C.S. Lewis and Narnia for Dummies": 179. ^ Bishop, R. (2000). "Good Afternoon, Good Evening, and Good Night: The Truman Show as Media Criticism". Journal of Communication Inquiry. 24 (1): 6–18. doi:10.1177/0196859900024001002. ^ Knox, Simone (2010). "Reading 'The Truman Show' inside out". Film Criticism. 35 (1). ^ Brearley, Michael; Sabbadini, Andrea (2008). "The Truman Show: How's it going to end?". The International Journal of Psychoanalysis. 89 (2): 433–40. doi:10.1111/j.1745-8315.2008.00030.x. PMID 18405297. ^ a b Beuka, Robert. SuburbiaNation: Reading Suburban Landscape in Twentieth Century American Fiction and Film. 1st ed. New York: Palgrave MacMillan, 2004. ix-284. ^ Hindes, Andrew (April 10, 1997). "Speed 2 shifted in sked scramble". Variety. Retrieved March 8, 2008. ^ "It's 'Show' Time". EW.com. Retrieved June 11, 2018. ^ Hontz, Jenny (December 18, 1997). "Peacock buys Par pic pack". Variety. Retrieved March 8, 2008. ^ "Turner Broadcasting Acquires Runaway Bride, Deep Impact, The Truman Show, Forrest Gump and Others in Film Deal With Paramount". Business Wire. March 6, 2000. ^ "The Truman Show: Rotten Tomatoes'". Rotten Tomatoes. Retrieved January 1, 2019. ^ "Truman Show, The (1998): Reviews". Metacritic. Retrieved March 16, 2008. ^ Ebert, Roger (June 5, 1998). "The Truman Show". RogerEbert.com. Retrieved March 21, 2008. ^ Turna, Kenneth (June 5, 1998). "The Truman Show". Los Angeles Times. Archived from the original on March 17, 2008. Retrieved March 21, 2008. ^ Turan, Kenneth (December 27, 1998). "'Truman Show' Was Definitely the One to Watch". Los Angeles Times. ^ Adam B. Vary (June 1, 2010). "The 100 Greatest Characters of the Last 20 Years: Here's our full list!". Entertainment Weekly. Retrieved July 7, 2012. ^ Berardinelli, James (June 5, 1998). "The Truman Show". ReelViews. Retrieved March 21, 2008. ^ Rosenbaum, Jonathan. "The Audience Is Us". Chicago Reader. Retrieved October 27, 2014. ^ Meek, Tom. "The Truman Show". Film Threat. Retrieved March 21, 2008. ^ "Academy Awards: 1999". IMDb. Retrieved March 21, 2008. ^ "Golden Globes: 1999". IMDb. Retrieved March 21, 2008. ^ "BAFTA Awards: 1999". IMDb. Retrieved March 22, 2008. ^ "Saturn Awards: 1999". IMDb. Archived from the original on February 6, 2008. Retrieved March 22, 2008. ^ "Hugo Awards: 1999". IMDb. Retrieved March 22, 2008. ^ Jesse, Ellison (August 2, 2008). "When Life Is Like a TV Show". Newsweek. Retrieved August 20, 2008. ^ Fusar-Poli, P.; Howes, O.; Valmaggia, L.; McGuire, P. (2008). "'Truman' signs and vulnerability to psychosis". The British Journal of Psychiatry. 193 (2): 168. doi:10.1192/bjp.193.2.168. PMID 18670010. ^ Kershaw, Sarah (August 27, 2008). "Look Closely, Doctor: See the Camera?". The New York Times. Retrieved January 8, 2009. ^ "NZ filmmaker adds to medical lexicon". 3 News NZ. March 20, 2013. Archived from the original on July 29, 2013. Retrieved March 20, 2013. Mercadante, Linda A. (October 2, 2001). "The God Behind the Screen: Pleasantville & The Truman Show". University of Nebraska at Omaha. Goldman, Peter (September 13, 2004). "Consumer Society and its Discontents: The Truman Show and The Day of the Locust". Westminster College. Hertenstein, Mike (July 13, 2000). "The Truth May Be 'Out There': The Question Is Can We Get There From Here?". Imaginarium Online. Archived from the original on June 16, 2008.